AFTER FOLLOWING THE OPERATING INSTRUCTIONS, you are ready to begin making floss. Pay attention to the direction of the floss as it is spun off the floss head. It should be thrown against and adhere to the side of the floss pan. Attached to the top plate of the spinner head are two floaters - these give additional air current for floss control. Twisting the leading edge of the floaters down will give more lift and floss will go upward - twisting down, the floss will go down. Pick up the cone, holding it an inch or two from the pointed end between your two fingers and thumb. Lift up the cone with the ring of floss attached and, by rotating the cone, wind the floss onto it. DO NOT ROLL FLOSS ON THE CONE INSIDE THE FLOSS PAN. ROLL IT ON OUTSIDE OF PAN ONLY. When you have practiced a bit, you might prefer to lift the ring of floss out of the pan with a flick of the wrist, turn the ring into a figure 8 and whip it around onto the cone. This leaves air pockets making it appear that you are building a larger web. WHEN STOPPING operation for the day or any prolonged period, it is a good idea to run all of the sugar out of the floss head. When empty, turn heat to the highest setting for approximately one minute to remove carbon from ribbons. NEVER ALLOW WATER TO ENTER THE FLOSS HEAD. A damp cloth will be sufficient to wipe off floss head after use. BE SURE TO UNPLUG MAIN ELECTRICAL SUPPLY CORD FIRST. Make sure all parts are dry before resuming operation. SUGAR FOR COTTON CANDY can be any 100% pure cane or beet sugar. Regular granulated is recommended, but avoid the Extra Fine Granulated or Bottlers Fine, and the so called "free flowing" as they may contain cornstarch, which will burn and clog the ribbons. Coarser sugars such as "coarse," "medium coarse" or "sanding" sugars can be used but will require a little more voltage to the head for best production. Premixed sugar, coloring and flavorings are available from the manufacturer. Ask your rental center owner for its availability. If you wish to "mix your own" using the manufacturer's "Flossine" and your sugar, follow directions carefully and mix well. About a tablespoon of water per five pounds of sugar will bring out bright colors. Do not use excess color as it will not deepen the color of floss since cotton candy is 98% air. If you flavor your own candy avoid using flavors that have a gum or starch base, which will burn on the ribbons. 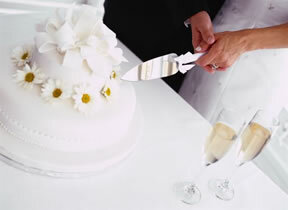 With a little care and know-how, cutting a wedding cake is a task easily mastered. Once you learn a few, basic steps, your wedding cake will will look as beautiful and as appetizing after being cut as before. After the bride and groom have made their first cuts, the following directions will help the person in charge of the cake cutting. Remember, you probably will not cut the whole cake. The first step is to use the right knife. Always use a sharp, thin knife. The cuts should be made by first inserting the knife straight down into the cake, and then by pulling the knife at an angle toward the outer edge. Before the next cut, wipe the knife clean with a damp cloth. 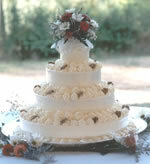 Start from the top by removing the 6" tier, which is usually the bride and groom's cake to be saved. Cut a circle about two inches from the outer edge of the 10" tier. 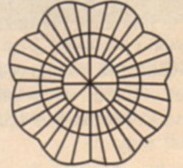 Work from this circle and make vertical cuts about one inch apart, until the ring is completely sliced. Use the same starting procedure and cut another two-inch ring, again slicing into one-inch pieces. Repeat the procedure until the tier is completed; then repeat entire process on 14" tier until all the cake has been served. Work from any side to cut a horizontal line about two inches from the outer edge of the tier. Slice from right to left to make vertical cuts about one inch apart, until the entire row has been sliced. Cut another horizontal line two inches from the new edge, and slice this row. Repeat until the entire tier has been cut. You should produce five rows in the 10" tier. Move to the 14" and repeat the process for seven rows. Heart and oval shaped cakes are cut in a similar fashion as square and rectangular cakes. See the guide below. Hexagonal shaped and petal shaped cakes are cut up in the same way as for round cakes. See guide below. Add to your party atmosphere with a popcorn machine! top of the machine must be clear of any obstruction. AVOID SERIOUS BURNS! DO NOT TOUCH KETTLE WHILE IT IS HOT! Turn on kettle heat switch and kettle motor and exhaust switch. "Test pop" a kettle of corn: place oil measure in kettle with three corn kernels; when kernels pop, place remainder of oil, measured corn and flavoring in kettle; close Lid. When corn has popped, rotate the handle to empty popcorn from kettle: return kettle to upright position. Repeat the cycle; subsequent batches are always more flavorful than the initial batch. Turn off the kettle heat switch on the final batch when the popcorn breaks over the lid of the kettle to eliminate smoke and odor. Turn off kettle heat and kettle motor and exhaust switches. Wipe exterior of kettle with heavy cloth after cooling of kettle to prevent burn or stain of oil drippings. Allow kettle to cool until warm enough to handle. Unplug kettle and remove from machine. Wipe kettle, kettle lids, crossbar and exterior clean. DO NOT IMMERSE KETTLE IN WATER! Remove poppets corn and pack in bags. Remove the "old maid" pan, empty unpopped kernels and wipe clean. Wipe interior of machine clean. Return the machine clean to the rental center to avoid cleaning charges. Consult your rental center for additional equipment and accessories for your event. The SnoKone machine is simple to operate and a great attraction for any event! ice against the revolving cutterhead to produce the shaved ice. Push ice down against the cutterhead with firm pressure for best sncw (too much - coarse ice; too little - mushy". DO NOT force the handle. Put only ice in the gooseneck to prevent damage to the blades. Keep fingers away front shaver body when motor is running to prevent injury. Wipe all surfaces clean to avoid cleaning charges. any of the hyperlinks below to go direct to the section you are interested in. that join to the top table. for the bridal party and as many round tables as required for your guests. party will have their backs to the other guests. the cake in its full glory! is to fill up the tables with unconnected guests. To ensure guests sit at the correct seat, table place cards should be used. invitations, place cards should be hand written. table place cards to co-ordinate with your wedding stationery. like to include on your top table. and page boys should sit with their parents. to the left of the groom - and for the gender of those seated to alternate. are, sit at the top table. thus avoiding having too many people on the top table. to sit alone or be accompanied by another relative such as a sibling or child. may like to sit with their new partner. to put them aside for just one day! the chief bridesmaid and best man. There are a variety of ways the bridal party can be arranged on the top table. to create a seating arrangement suitable for your particular circumstances. the bridal party each host a separate table (preferably round tables).